Our mind is a bright mirror, free from dust. The work is first of all a mirror of our mind. 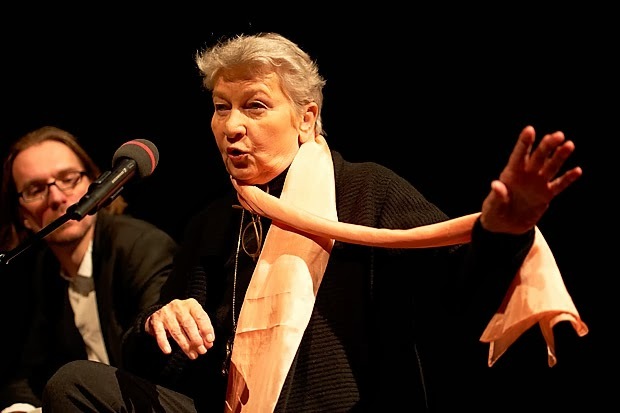 There is clearly something happening in our time, this ninth decade in composer Eliane Radigue's life, that is mirrored in the recent, sharp increase in attention to her body of work, the proliferation of archived and contemporary pieces available lately, and the on-line resources easily accessible to interested parties. 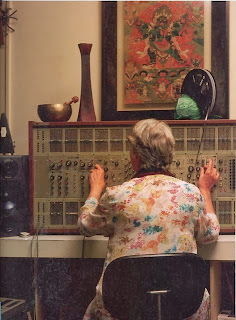 Consider this - when I published my appreciation of Radigue only four years ago this week, there were such scant articles/interviews available in the aether, it was necessary to reference the same several texts, even photos, as everyone else. Radigue assistant, archivist and tireless advocate for her work, Emmanuel Holterbach, has done much to remedy that paucity of material related to the composer, as has composer Jennie Gottschalk, whose sound expanse blog provides links to numerous articles and interviews of recent vintage. From 1983-2003, there were seven releases more or less available of Radigue's synthesizer and tape compositions; from 2003-2013, 15 releases came in waves, five of them in 2013. These are spread across numerous labels issuing from several countries, and are of improbably consistent high quality. In 2006 came the 14 minute Institut Für Medienarchäologie (IMA) documentary, Portrait #4, providing just enough of a glimpse of Radigue to whet our appetites for more. One of the two camera operators and editors on Portrait #4 was Anais Prosaic, who released her lovely 61 minute documentary L'Écoute Virtuose / Virtuoso Listening in the Fall of 2012. Prosaic is a documentarian based in Paris who has made films with subjects ranging from Patti Smith to Ethiopian singer Mahmoud Ahmed. I revisited Portrait #4 as a companion to my multiple viewings of Virtuoso Listening, struck by a couple of threads that tie these impressions of Radigue, separated by seven years, together. Filmmaker Prosaic can be credited with binding these elements visually, with clarity and a light touch. First, the flow of two of Radigue's elemental metaphors for her compositional approach, and the concomitant listening experience: water and the mirror. Near the conclusion of Portrait #4, in a brief section entitled Écoute, Radigue says, in reference to listening to the Arp and tape works she composed between 1967-2000, ...it's like looking at the surface of a river...it's never completely the same, according to the way in which you look...regarding these kinds of sounds, it's that they act as a mental mirror. Forward to her 2012 interview with Max Dax - I use this river image myself to represent one of my Adnos pieces...if a stone in the river moves, the river is not changed, but after a long time it becomes something different. The eight chapters of L'Écoute Virtuose / Virtuos Listening are demarcated by images of the surface activity of water, both the water imagery and titling foreshadowed in the 2006 film. Prosaic is content to allow her portrait of Radigue to be limned via the conventions of such documentaries: archival footage, anecdotes, interviews and performances. She trusts the subject to be sufficiently compelling without the superfluous and self-conscious filmic gestures that irritate the viewer in less confident filmmakers. The imagery is distilled down to water and the mirror-mind experience of hearing Radigue's music. The listening experience is filmed chiefly during the staggering Triptych concert series, an event honoring Radigue's work held June 12-26, 2011 at various venues around London. Of the eight concerts comprising that event, Prosaic focuses on performances by, and interviews with, Rhodri Davies, Bruno Martinez, Carol Robinson, Charles Curtis, Kaffe Matthews, Kaspar T. Toeplitz, Ryoko Akama, and Emmanuel Holterbach. At the conclusion of Portrait #4, a text appears on the screen stating currently Radigue is composing only for acoustic instruments; with the exception of the laptop ensemble The Lappetites, comprising AGF, Matthews and Akama, the concerts glimpsed in L'Écoute Virtuose / Virtuos Listening are of the growing wave of acoustic musicians realizing Radigue's work (since this event add to that list Nate Wooley, Julia Eckhardt, Robin Hayward and others this author is no doubt unaware of). While each performer essentially reiterates their regard for the composer, the rigors of performing her works on their respective instruments, and their subjective states during and after performance, there is an interesting aspect to their reports of how they collaborate with Radigue. They talk about entering into a relational process that involves minimal explicit cues/clues from the composer and zero actual scores; instead, in a sort of lineage process of transmission of a seed idea, with an expectation from Radigue that the musician will then realize the work by their own lights, another mirroring is seen- that of Radigue's four decade practice of Tibetan buddhism. Tibetan buddhist practice, like that of the zen lineage, involves the student initially receiving pointers from a teacher who encourages the student, verbally and tacitly, to move beyond the teacher in their own fashion. Radigue exultantly states at the conclusion of L'Écoute Virtuose / Virtuos Listening, I have musical descendants like I have biological descendants! I do not make a work for the instrument, but for the instrumentalist, Radigue said in her 2010 WNYU interview. Filmmaker Prosaic entered the flow of events in the composer's life at a crucial point, as the woman cellist Charles Curtis describes as persistent, critical, alert and full of self-doubt was transitioning from a self-imposed, nearly four decade musical practice of rigorous solitude, to an intensely intimate, collaborative one. Radigue would work on Naldjorlak, her first piece for acoustic instruments/instrumentalists, from 2005-2008; Prosaic's documentation intersects this vital new chapter for the composer appositely. It is a remarkable development - a remarkably flexible, fecund and moving one. If like me you have experienced the power of Radigue's Trilogie de la Mort - a massive composition in many respects, the composer's response to the loss of her young son and cherished spiritual teacher, Pawo Rinpoche - witnessing via Proasic's film her joy in connecting with a couple of generations of musicians and composers affected deeply by her work is a profound experience. Talking about working with Radigue, Kaspr T. Toeplitz says What she is saying is that the score is now me. Anais Prosaic's film documents the mirroring of Eliane Radigue's life, in her music, her practice, and her descendents' lives. This is something to be witness to, and I encourage you to see this film.